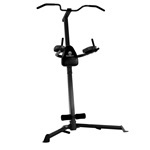 Pull up stations also known as power towers, workout towers, pull up & dip stations and chin up stations, allows you to do several different types of exercises using primarily using your own body weight. The construction of a pull up station is usually steel as it needs to be strong and sturdy to support the users. Depending on the model, 2 people may be able to use the station simultaneously, some models have the push up bars located at the back of the stand so one person can use the push up bars whilst the other uses the pull up bars or dip station. Pull ups – This mainly works the back muscles which include the lats (latissimus dorsi) and traps (trapezius), it also works on your biceps. Pull ups can be done wide grip or short grip, short grip with your palm facing you will put more emphasis on your biceps. Dips – Dips mainly targets your triceps but also works your chest, shoulders and abs, you can increase the weight by wearing a dipping belt and adding weights onto the dipping belt. Be careful not to dip down too low as this can aggravate your rotator cuff, you should go down until your shoulders are in line with your elbows. Push ups – Although push ups can be done on the floor without any equipment, doing push ups on the push up bars located at the bottom of most of the power towers is more effective than just a normal push up as it allows a wider range of motion and requires more balance. Leg raises – The padded backrest and arm rests allows you to keep your back more relaxed and stable, whilst you raise your legs which will target the core muscles primarily but it’ll also target your quads especially if you keep your legs straight when raising them. Sit ups – Some power towers will have a horizontal bar located at the bottom of the stand, this will allow you to lock your feet in place to keep your body stable so you can do sit ups or ab crunches. 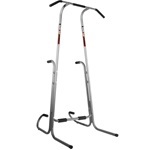 What will you be using it for – Most pull up stations will offer very similar features but some will offer more such as a horizontal bar at the bottom for sit ups. 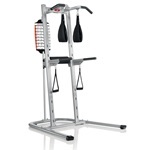 Decide what muscle groups you want to work on and what exercises you would want to do, then you can check whether the pull up station offers the features to allow you to do those exercises. 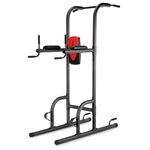 Where to place it – A lot of the power towers have the push up bars located at the back, so unless you’re not planning to use the push up bars you can’t place the stand with the back against the wall otherwise you won’t be able to access the push up bars. Models such as the Marcy Power Tower is designed to fit into corners so this design is quite space saving if you’re a bit tight on space. 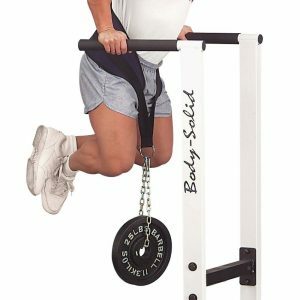 Maximum weight capacity – The maximum weight capacity should be enough to support most people, however some people may wear a belt to additional weight when they’re doing pull ups or dips and this might take them over the weight capacity. 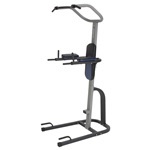 If you feel like you’re capable of adding on extra weight, then consider choosing a pull up station that has a higher maximum weight capacity.